Extra Wide Single Wide 18'! This home has all the features your looking for. 1. 12 Year Structural Warranty. 2. Vinyl Dual Pane Windows. 4. Tape & Textured Walls Throughout! 6. 84" walk In shower. Call us today 432-563-1099 for more information. Model is not on display at this time but it is ordered so you can get your home sooner. 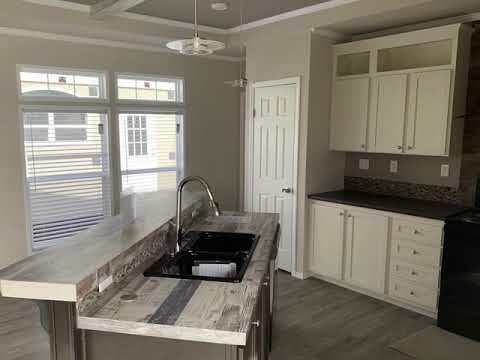 Palm Harbor Homes is thrilled to be providing beautiful Midland manufactured homes and modular homes in Texas! We are very excited about bringing the country's premier quality-built homes, outstanding service and factory-direct pricing to the people of Midland. Team Palm Harbor Homes of Midland, Texas has the following services available for you, your family or your Company. Shopping for modular or manufactured homes in Texas? We want your business! No matter what you’re housing needs are we can build it. Our company has the experience and the best customer service in the industry. Whether you’re looking for a home for your family or need a 10,000sq ft oilfield bunk house unit WE CAN SAVE YOU MONEY AND TIME! Located on Business I-20 (Old Hwy 80) half-way between Midland International Airport and the city of Midland. Please call 563-1099 for specific directions.